I’ve had a long love affair with La Reyna, the queen of South Austin’s Tex Mex restaurants just south of the Colorado River in the Bouldin Creek neighborhood. She’s been a good lover. One who has accorded me many delicious meals in my decade plus patronage. I’ve expounded at length on her charms in the past but this discussion shall relate to perhaps her most humble menu item; the bean and cheese taco. 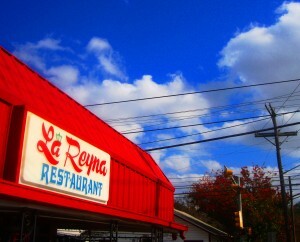 Of the multitude of charms La Reyna offers, I believe this may have been the only one I’d not sampled. The taco arrives as a carefully wrought take on the classic. A big ladle of creamy refrieds basking under a mantle of bright yellow Tex Mex cheese. The beans are rich with pork, partly creamed and partly whole. The tortilla [at La Reyna flour is king] is a perfect take. Pillowy with little blisters and hot off the comal. The salsa is the Tex Mex classic of tomatoes, onions, cilantro and jalapeno chiles. It’s bright and hot, a perfect foil to the pinto beans. At $1.68 the bean and cheese taco provides a very good value. It’s portion is ample and the flavors a walk through a skilled Mexican kitchen. This entry was posted in FOOD, The Foodist, The State of Bean and Cheese Tacos In Austin Texas. Bookmark the permalink. I found La Reyna from your CH posts and owe you for that. The only Tex-Mex in this city that I have ever truly enjoyed. Have not had the bean & cheese either–will try it next time. At El Taco Rico this weekend, had their b&c and while enjoyed not enough to replace my staple of potato & egg and bacon & egg.